You can edit the details of a location's operatories as needed. Note: To view all active and inactive operatories in the list, select the Include Inactive check box. 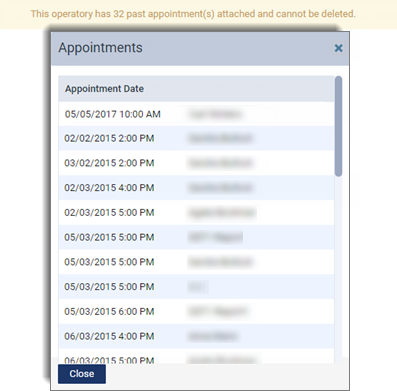 Tip: If this operatory has appointments and/or events scheduled in it, a message in a yellow box appears. To view a list of those appointments and/or events, click (or tap) the yellow box. Change the name, and/or modify the other options as needed. Name - A unique name for the operatory (up to 10 characters in length). This name will appear at the top of the corresponding column on the schedule. Description - A unique description for the operatory (up to 25 characters in length). 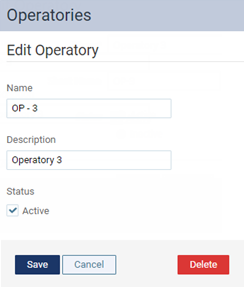 Status - You can schedule appointments and events in an Active operatory, but an Inactive operatory will not appear on the schedule and will not be available for selection from the View menu of the schedule. You cannot inactivate an operatory that has future appointments scheduled in it.